It's the earrings version of Fancy Marquis Pendant! Vickie thought that this long, larger earrings are all the rage right now, especially in this diamond shape. 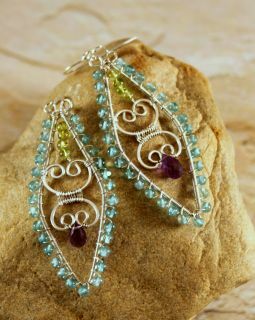 She love the vibrancy of these apatite, peridot and amethyst gems. List of tools and materials are included, available for instant download now with 20% discount system implemented! Hope you have fun creating this pretties!